Scientists say they’ve discovered a network of fluid-filled tissue that lines the body, calling it the interstitium. Above, a representation of how it looks. Anatomy books are in need of a major upgrade, argue a team of scientists in a paper published Tuesday in the journal Scientific Reports. They say the body contains a previously undiscovered network of fluid-filled pockets and collagen underneath the skin that covers most of the body and internal organs. More than that, the structure should be considered an organ itself. The proposed organ, christened the interstitium (“interstices” being a catch-all term for the space between the structures of the body), was discovered accidentally, the researchers say. They stumbled upon it while conducting routine endoscopies, a medical procedure that sends a small camera down your gullet in order to look at the digestive tract. Newer versions of the endoscopy, using lasers, now allow doctors to look at living tissue on a microscopic level. But when they took a peek at patients’ bile ducts, instead of finding the dense connective tissue assumed to be enveloping most organs, they saw something else: a mesh-like pattern of dark branching bands made of collagen surrounding large, fluid-filled spaces. The first researchers soon got others on board to confirm their endoscopy results in other parts of the body, including right underneath the nose. They also theorized that scientists had missed the interstitium because of how tissue samples are routinely collected and studied, leading to the pockets of fluid collapsing on themselves and creating the illusion of completely solid tissue. So they carefully extracted bile duct samples, froze them to keep the structures intact, then looked at them underneath a microscope. As expected, they once again found the fluid pockets surrounded by bundles of collagen. 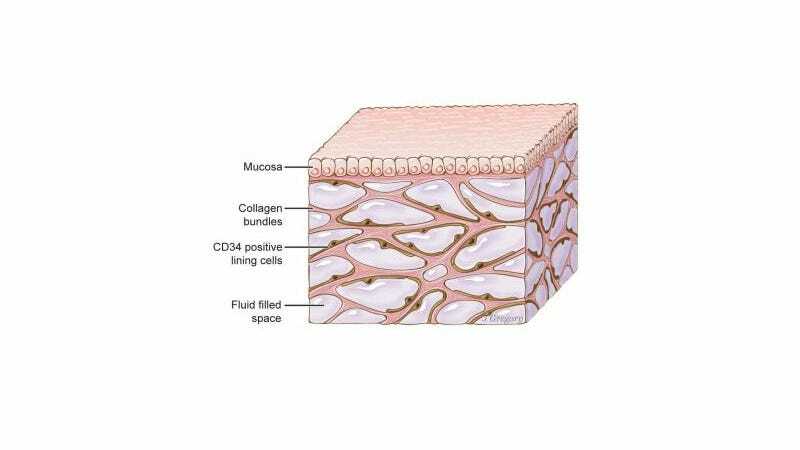 The interstitium is believed to contain up to a fifth of the body’s total fluids. And the fluid itself is thought to be lymph, a colorless liquid produced by our lymph nodes mostly made of white blood cells. Theise and his team believe the interstitium both acts as a cushy shock absorber for our internal organs, as well as an inner body highway for white blood cells and possibly other cells. Crucial as it appears to be, the researchers say, the interstitium could play a role in disorders of the body like cancer, episodes of internal swelling called edemas, and a variety of conditions of the gut and other organs. In some patients with metastasizing cancers, they found evidence that the cells had escaped their initial site by hitching a ride along the interstitium. The organ might even help explain why our skin wrinkles or our limbs become less flexible as we age, and why tattoos stay as permanent as they do. If the research ends up being confirmed by other teams, the interstitium would be the latest “new” organ discovered recently. Last year, scientists capped off years of work showing that a long-speculated body part called the mesentery, which attaches our intestines to the abdominal wall, should be considered an organ in its own right. Their decade of research convinced the authors of Gray’s Anatomy, the longstanding medical textbook first published in the 19th century (not to be confused with Grey’s Anatomy, the longstanding medical TV show), to classify the mesentery an organ in their latest edition. The mesentery and interstitium would be the body’s 79th and 80th discovered organs, respectively.